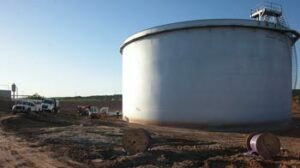 Storage Tanks | Matcor, Inc. This month MATCOR will ship the final tank anode system assemblies for Africa’s most audacious industrial project. The project is being undertaken by Aliko Dangote, Africa’s richest person, and when completed this $12 billion Dangote oil refinery could, according to a 2018 New York Times article, “transform Nigeria’s corrupt and underperforming petroleum industry. Planned as the world’s largest refinery…should process 650,000 barrels of crude oil daily.” With Nigeria poised to become the world’s third most populous nation by 2050 (surpassing the USA) and having Africa’s largest economy, this project is being touted as a milestone achievement in what many are dubbing the African Century. As part of this ambitious refinery project, a total of 153 above ground storage tanks for crude oil, refined and intermediary products up to 92m in diameter (300 ft) are being erected on the 6,180 acres of swampland just outside of Lagos, Nigeria. MATCOR’s innovative tank anode system technology using linear anodes was selected by the project’s EPC contractor, Engineer’s India Limited, as the design basis for the cathodic protection for the project’s above ground storage tanks. Working closely with both the owner’s Indian based engineering team and the EPC contractor, MATCOR was successful in identifying the key tank contractors that would be bidding the tank erection and supplying the cathodic protection systems as part of their specifications. Ultimately, MATCOR was successful in securing contracts to provide the linear anodes for each of the three tank packages, one from a Chinese contractor and two from a UAE based contractor. Tank anode system materials prepped for export at MATCOR’s Chalfont PA facility. Over 520 reels of anode material have been shipped to Nigeria. 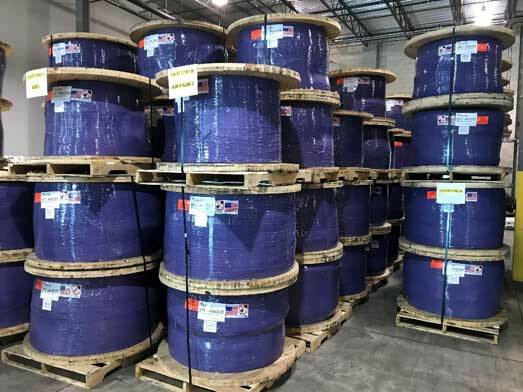 In total, MATCOR has supplied over 500,000 linear feet (150+ km) of our SPL™-FBR linear anode product along with other ancillary materials for the under tank cathodic protection systems over an 18-month period. With all the anodes having been manufactured in MATCOR’s ISO 9001 certified Chalfont PA facility, MATCOR continues to be the global leader in the manufacturing of impressed current linear anodes for above ground storage tank cathodic protection. Have questions about tank corrosion protection, or need a quote for services or our tank anode system? Contact us at the link below. Specifying the ideal sand bedding supports tank corrosion protection and a long tank bottom service life. For new construction tank projects and for retrofits of existing tanks, it is common practice to install clean washed sand as the pad upon which the tank bottom is fabricated. The use of oil sand, crushed stone, asphalt, or other materials directly under the tank bottom should be avoided, as these hinder effective tank corrosion protection. This article provides guidelines to the specifications for the sand bedding materials. These guidelines are based on providing a low corrosivity environment compatible with cathodic protection to assure a long service life of the tank bottom. For a typical 150-foot diameter tank using 12 inches of sand bedding the quantity of sand that is required is approximately 17,679 cubic feet of sand which is roughly 883 tons. The cost of the sand, including delivery, is a significant cost and far exceeds the cost of cathodic protection– especially if the sand specifications are quite stringent and require sourcing sand that requires significant transportation. Some consideration can be given to relaxing the sand recommendations, even if that warrants increasing the cathodic protection requirements, should there be a significant cost impact to complying with the sand specifications – consult your cathodic protection designer. The table below summarizes the recommended sand properties to support aboveground storage tank corrosion protection. The best proxy for determining corrosivity of sand materials is the electrical resistivity of the sand. Clean washed sand typically has resistivity values more than 20,000 ohm-cm and in some cases can exceed 100,000 ohm-cm. 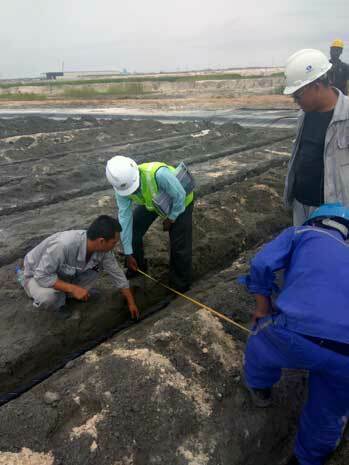 The higher the resistivity of the sand, the lower the corrosivity of the sand; however, when designing cathodic protection, the higher the sand resistivity the greater the impact on the overall system resistance and the electrical power required for the cathodic protection system. API Recommended Practice 651 Cathodic Protection of Aboveground Petroleum Storage Tanks provides the following table classifying resistivity of soil/sand. Chlorides will affect the resistivity of soil, and act as a depolarizing agent which will increase the current requirement for cathodic protection of steel. Pitting corrosion on steel can begin at chloride levels of 10 ppm. Chloride content may be deter­mined in accordance with ASTM D 512 or equivalent. Sulfate levels >200 ppm frequently indicate high concentrations of organic matter. Sulfate content may be determined in accordance with ASTM D 516 or equivalent. Sulfide levels > 0.10 ppm may indicate that sulfates have been reduced by bacteria. Sulfide content may be determined in accordance with EPA 0376.1 or equivalent. The sand bedding material should be clean of rocks, clumps and other debris and for clean sand capable of passing through a #4 sieve, for washed river sand an alternative acceptable particle size is 100% pass through a 3/8” sieve. For new construction tanks, the typical design is to provide a minimum of 12 inches (30 cm) of sand cover; however, for tank bottom retrofits it is quite common to provide 6 inches of sand (15 cm) for double bottom installations or for applications where the existing bottom is removed, and the top layer of the underlying soil foundation is being removed. Have questions about tank corrosion protection, or need a quote for services or cathodic protection design and materials? Contact us at the link below. Read Ted Huck’s article that appeared in the August issue of BIC Magazine, in which he addresses grid anode vs. concentric ring systems and best engineering practices for AST’s. This program applies to replacement cathodic protection systems for above ground storage tank (AST) bottoms. With existing ASTs, you may not always have the luxury of a planned tank bottom cathodic protection system replacement. After taking a storage tank out of service for inspection, you are often required to make an immediate decision as to the integrity of the existing floor. In some cases, this means a new floor has to be quickly planned and installed to minimize the time that the tank is out of service. MATCOR is pleased to announce our stock tank bottom anode system to meet your replacement needs with very short notice. For your tank bottom replacement applications where a very fast delivery is required, MATCOR will now be maintaining stock of our Tank Ring Anode System. Designed for 25 mA/ft output which is generally sufficient for 50+ year anode life based on a nominal current density of 2 ma/ft2 of surface area. For more information please contact your MATCOR sales representative or contact us at the link below. Have questions or need a quote for a replacement tank bottom cathodic protection system? Contact us at the link below. In terms of corrosion prevention for under ground storage tank (AST) foundations, is cathodic protection (CP) effective? For tanks erected on compacted soil or sand foundations, with or without a concrete ring wall, cathodic protection is considered a “good engineering practice” and has been proven as an effective means of addressing tank bottom corrosion concerns. When you compare various methods of corrosion prevention for above ground storage tank bottoms, CP is shown to prevail over asphalt or concrete unless your project involves smaller diameter tanks. The corrosion failure rate is greater for tanks built on asphalt or concrete compared to tanks where a concentric ring cathodic protection system is installed. In terms of corrosion, when is asphalt or oil/sand acceptable for above ground storage tank (AST) foundations? Asphalt foundations are not common in the United States, as the mechanical integrity of asphalt can be an issue depending on the AST environment. As well, the use of oil/sand layer designs has been phased out by most tank owners in the United States due to the adverse impact that these oil/sand layers have on tank bottom cathodic protection systems. While historically prevalent in the Middle East and Asia, most larger national oil companies have abandoned this approach because it causes shielding of cathodic protection (CP) current, allowing corrosion to occur. Kuwait Oil, Aramco, and others now prefer clean sand combined with CP as the base material of choice. This is standard in the United States and has been for several decades. What is a Concentric Ring Cathodic Protection System for above ground storage tanks (AST)? A. Designed for long-term storage, an AST cathodic protection ring system offers a factory-assembled design whereby the anode rings are ready to install with cable leads that extend past ring wall penetration. Concentric rings sizes are made to order, requiring no onsite welding, cutting, or splicing. The anode locations are marked, rings are laid out, and cabling is placed using a proven labeling system for future monitoring. A mixed metal oxide (MMO) anode is centered among a low-oxygen-generating coke backfill to eliminate depolarization. Learn about MATCOR’s complete AST cathodic protection design services. Are there some cases where concrete foundations are advantageous for tank farm corrosion prevention? 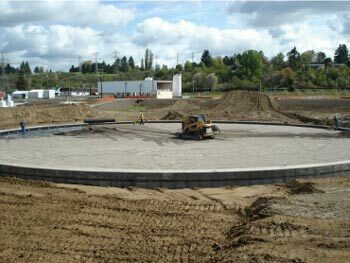 During installation of above-ground storage tanks, there are some advantages to concrete foundations for tanks when it comes to corrosion—the high pH of the concrete acts to passivate the steel, unless you have an above ground storage tank (AST) liner pad or something that is between the concrete and the tank bottom. If you can effectively seal the chime from the ingress of water and oxygen, the corrosion rates are generally quite small. Unfortunately concrete foundations for larger diameter tanks are not typically practical and can be quite expensive to properly install. Concrete foundations with appropriate AST liners are best for smaller diameter tanks. In tank farm design for corrosion prevention, what are the best recommendations for above ground storage tank (AST) liners? Plastic secondary containment liners are largely phased out in the United States and have been replaced by geotextile membranes that serve the same secondary containment purpose as plastic—they are conductive to allow cathodic protection (CP). The general standard in the United States is to have a CP system directly under the tank in order to minimize stray current or current losses due to earthing systems around the tank. Since the tank bottom is a large bare structure and the anodes are closely coupled to the tank bottom, there is usually very little current drain to other structures; the system if properly designed can accommodate modest current drain. While a plastic liner provides isolation from other nearby structures, when a problem arises with the CP system or if the CP system reaches the end of its projected service life, there is no way to install a new CP system without replacing the tank bottom. Tank farm corrosion prevention is more manageable now than ever before. 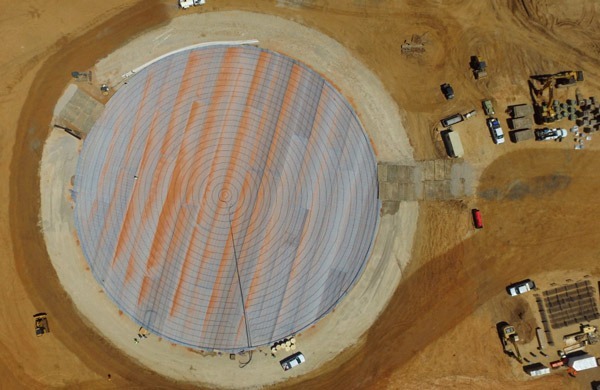 The MATCOR Concentric Ring Cathodic Protection System™ is just one of many excellent options for protecting your above ground storage tank (AST) from damaging corrosion. 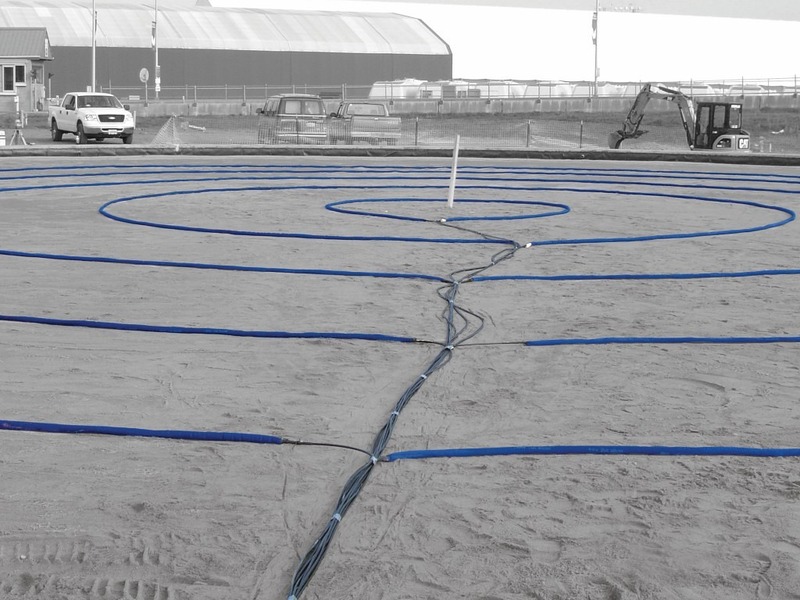 For assistance with tank farm design, our Concentric Ring AST Cathodic Protection System™, project management or installation, please CONTACT US. We’re excited to share this aerial drone view of a recent tank CP installation starring MATCOR’s exclusive Tank Ring Anode™ System. Superior to grid anode systems for tank bottom cathodic protection, the Tank Ring Anode System is factory assembled in concentric rings sized for your tank and shipped ready for quick installation. 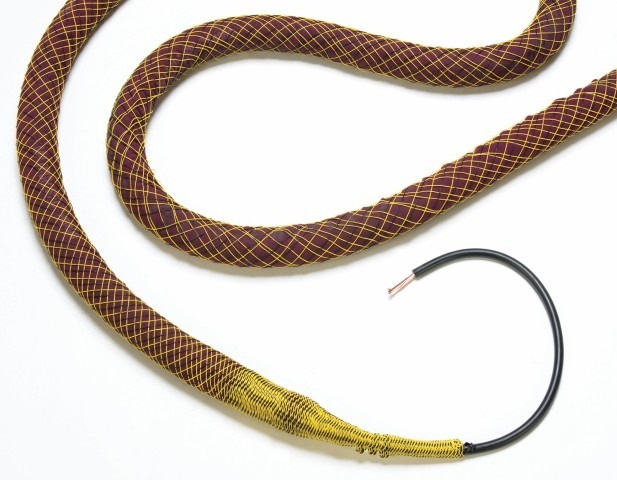 Learn about MATCOR’s complete cathodic protection installation services. Learn more about this newer method of cathodic protection for tanks and its benefits over the more traditional grid anode system—read the full article at HERE. For assistance with impressed current anode system design for tank bottoms, project management, installation or field service, please contact us at the link below. MATCOR was recently issued US Patent No. 9,410,253 for its SPL-SandAnode, an impressed current linear anode that prevents corrosion of above ground storage tank bottoms (ASTs). Invented by Glenn Shreffler, executive vice president of engineering for MATCOR, the SPL-SandAnode is the only impressed current linear anode designed specifically for tank bottom replacement projects. These applications typically have six inches (150 mm) or less of sand where the anode is to be installed. MATCOR’s SandAnode is the only impressed current linear anode designed specifically for tank bottom replacement projects. The recommended cathodic protection system for most ASTs is a tank ring anode system that utilizes linear anodes in a concentric ring configuration. However, when the clearance between the tank bottom and anode is less than 6-inches (150 mm), the SPL-SandAnode is used, either in the concentric ring configuration or in parallel linear lengths. The prepackaged linear anode with a sand backfill, in lieu of calcined coke, allows the anode to be simply laid out on the foundation while easily maintaining the maximum separation distance of the anode to the tank bottom. External corrosion of above ground storage tank (AST) bottoms is a significant problem for tank owners. Corrosion professionals tasked with protecting these structures should consider multiple factors. One thing is clear: proper installation of an impressed current tank bottom cathodic protection system plays an important role in reducing corrosion and extending the service life of the tank bottom. Learn more about this newer method of AST cathodic protection and its benefits over the more traditional grid system. 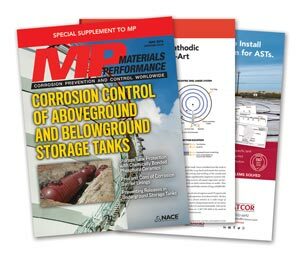 For additional information about tank bottom cathodic protection, please read our article in the special supplement “Corrosion Control for Aboveground and Belowground Storage Tanks” in the May issue of NACE International’s Materials Performance. Contact MATCOR about your AST cathodic protection requirements or learn more about our Tank Ring Anode™ System. As you watch the evening news or pick up your daily paper you will very likely read about the new Missile Defense Shield in Romania that came on line this week. The Russian response has been loud and indignant. This story will be all over the evening news, cable channels and newspapers. But did you know that the Deveselu facility in Romania has a MATCOR Cathodic Protection system protecting the buried piping and process tanks? MATCOR VP of engineering Glenn Shreffler made three trips to the site during its construction. So when you watch the evening news and they discuss the “controversial” missile defense base in Romania, we are proud that MATCOR anode systems are hard at work protecting the assets that protect our NATO allies. 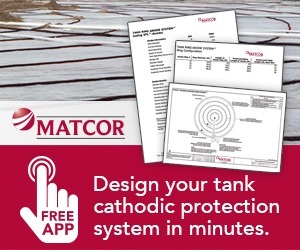 Contact MATCOR about your tank and piping cathodic corrosion prevention requirements or learn more about our wide range of cathodic protection products.